The colourful design guru Karim Rashid gave his first ever talk in London to discuss his design philosophy. Rashid started by saying democratic design is very important to him. In his opinion design is also a social and political act. It is about creating better experiences for more people – progress. He also said design is about shaping. Being present in a moment, the social behaviour should be the criteria to shape the future. When designing is based on visual imagery only, and not the experience, it is subdued. Rashid was criticising design by saying that today there are many variations in the marketplace but few ideas. Products are repeating same old archetypes and designing becomes styling. He likes to push ideas further by being more creative. When he is designing a new restaurant, he always starts from the food to understand how the chef is thinking and what the restaurant really is about. 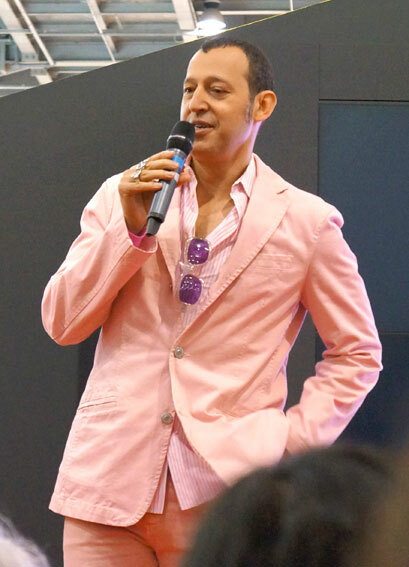 Karim Rashid is known from his futuristic style. He told that he hadn’t designed anything in 2D for 7 years. Old style static 2D design based on the grid has created a world full of square shape archetypes. In his opinion 3D design will create a world of 4D experiences that are more organic and moving. So the world becomes more unpredictable. Morphic structures will be more common. (The running shoe industry is a good example of advanced 3D design). Rashid talked about the huge changes from the digital age for the consumer. The empowerment of the individual so that everyone can become a designer and a critic is a big change for the creative industry. Another trend Rashid talked about is the casualisation and increased comfort. This he said also extends to thinking modes. In the casual age people think and work more flexibly in more casual environments. The notion of shifting must be addressed to design. What is Rashid’s take on luxury today? It is the feeling when everything just works.